Set in the same universe as my visual novel game, Three Guys that Paint. Consider this a DLC of Three Guys That Paint. You don't need to play it before playing this game, but it gives you a better understanding of one of the characters in this interactive fiction. A Tune at the End of the World is an interactive fiction game. It contains a text parser, allowing you to type in a command that can lead to varying results (e.g. "look at kitchen," "drink beer," "say hello"). For more information and additional links, please visit Three Guys That Paint's website page. A walkthrough is available below. For your entertainment, it is written and presented in a similar narrative style as the game itself. 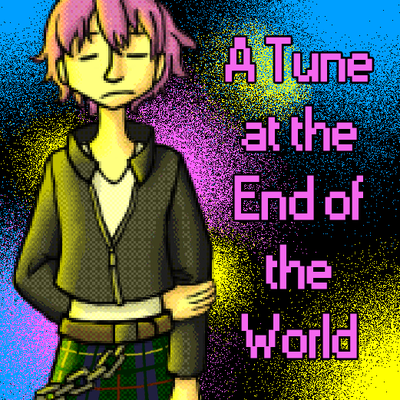 Behind-the-scenes information on A Tune at the End of the World can be found in Three Guys That Paint's Behind the Scenes Booklet. Type: IF, Interactive fiction, adventure game, puzzle. Genre: Sci-fi, slice of life, comedy. Made for 2015's Punk Jam. ​Also, if you like my work, please consider pledging to my Patreon page. There are rewards for patrons there.